MSI'S Combination of power, cooling and innovationThe MSI GeForce GTX 16-Series Graphics Cards are driven by the all-new NVIDIA Turing architecture and with the GeForce GTX 1660 Ti VENTUS XS OC producing a Boost Clock of 1830 MHz this card will give you incredible new levels of gaming power with realistic visuals and high framerates. 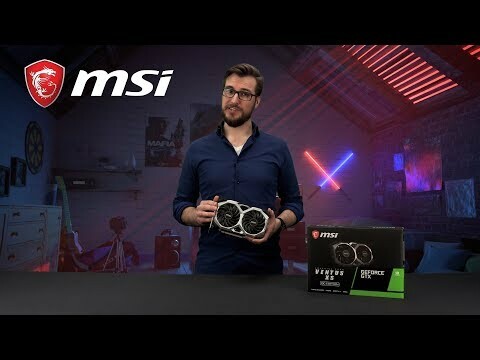 Pairing with the raw power of NVIDIA's latest GTX GPU, MSI have implemented their TORX FAN 2.0 Technology into the card, an award winning fan design that gives you cool and quiet gaming by having two different fin designs that work in unison to give you the best cooling results. Eliminate fan noise with MSI's Zero FROZR which stops the fans in low-load demands allowing you to focus on your game and not be distracted. Up to 6 times faster performance The MSI GeForce GTX 1660 Ti VENTUS XS OC card is powered by the Turing Architecture, this gives you 6x faster performance over previous graphics cards. Turing uses a new 12nm manufacturing process and also brings extra GPU power to your games. Providing long term, high quality cooling performance Using two of the award-winning TORX Fans 2.0, THE MSI GeForce GTX 1660 Ti VENTUS XS OC graphics card will provide years of top-notch cooling performance. IMPROVED DISPERSION DESIGNThe dispersion fan blade has a steeper curved blade which accelerates the airflow, increasing its effectiveness. TRADITIONAL DESIGNA traditional fan blade pushes down a steady airflow to the massive heatsink below. Matches Your Demands Automatically First introduced in 2008 by MSI, ZERO FROZR technology stops the fans completely when temperatures are relatively low, eliminating all fan noise when no cooling is needed. When things start to ramp up during gaming, the fans will automatically start spinning again to keep your card cool. Nvidia has whet the appetite of enthusiasts with GeForce RTX graphics cards armed with forward-looking technologies that promise to revolutionise in-game visuals for years to come. MSI GeForce GTX 1660 Ti VENTUS XS OC 6GB GDDR6 VR Ready Graphics Card, 1536 Core, 1500MHz GPU, 1830MHz Boost is rated 4.0 out of 5 by 2. Rated 4 out of 5 by DrHickman1983 from Good upgrade if you skipped the GTX 10XX series I upgraded to the 1660ti from my old 970, as I didn't bother upgrading to one of the 10XX cards, and it's great. As the RTX 20XX cards only really come into their own on larger resolutions and through ray tracing, the 1660ti offered a much better solution for my personal needs, as I play at 1080p and haven't got much interest in the latest graphical effects.